The Three-Creeks Trail is envisioned as a multi-use trail running over a former Union Pacific railroad line stretching from Lonus Street near Lincoln out to Kelley Park. Originally this trail was named after the railroad line, which was called “The Willow Glen Spur” because a portion of it went through the town of Willow Glen. In 2008 a community advocate recommended that the name of the future trail should be the Three Creeks Trail because it intersects three creek trails: the Los Gatos Creek trail, the Guadalupe Creek trail, and the Coyote Creek Trail. This trail would be extremely useful for anyone who travels cross town because of the intersections with so many other trails in the city. Trails are important to people who walk, bike, push strollers, walk dogs, or ride wheel chairs. Trails make it easier for people to commute, get exercise, and socialize. This line was abandoned for use in 2000, and in the same year the City of San Jose Parks Department strategic plan envisioned the purchase and conversion of this land for trail use. Union Pacific removed the rails in 2004. Since then some of the land has been purchased by other landowners, and is threatened in other ways. It is our goal to assist local government in creating a workable trail on this property. Over the course of several years, from 2008 through 2011, the City of San Jose was engaged in a process (“Envision 2040”) to involve the community in updating the City’s General Plan. During the update process, city staff proposed to change the location of the eastern portion of the trail from the railroad right-of-way to bike lanes on Alma Street, a high-traffic truck corridor. SAVE OUR TRAILS successfully fought off this proposal, getting the Council, the Parks and Recreation Commission, and the Envision 2040 Task Force to keep the trail alignment on the railroad right-of-way. In addition, SAVE OUR TRAILS persuaded City Council to rename the trail as “the Three Creeks Trail”, in recognition of the fact that the trail will be providing an essential east-west path, linking three separate north-south trail corridors. 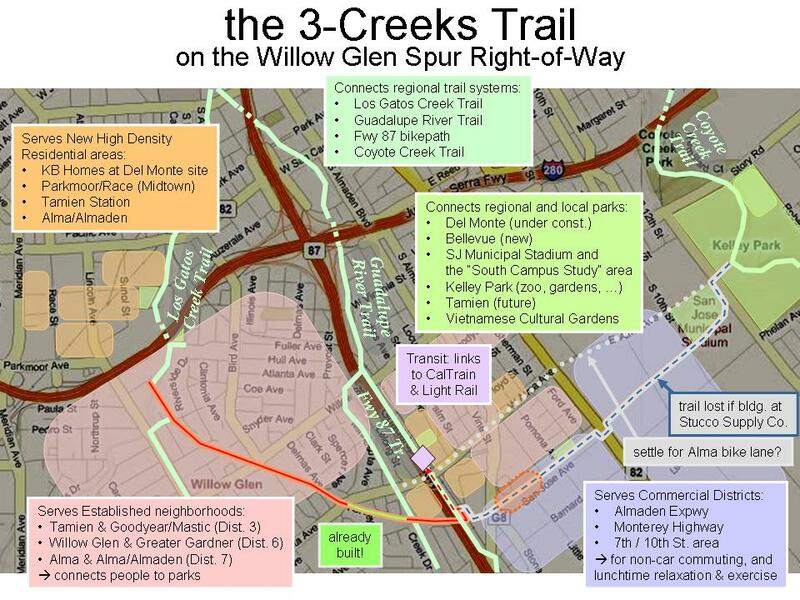 As a result of the efforts of SAVE OUR TRAILS and our supporters, by September, 2011, the current General Plan for the City of San Jose included the full length of the alignment of the Three-Creeks trail (shown there as the “Willow Glen Spur Trail”). On May 29, 2013, the City of San Jose held the second of three planned workshops to solicit community input on the design of the western section of the Three Creeks Trail. The materials for that workshop, and the results can be found on the San Jose website; click here, and scroll down to “Workshop #2”. On April 9, 2013, the San Jose City Council voted to amend the contract for engineering services with CH2M to include the Three Creeks Trail Pedestrian Bridge. On April 2, 2013, the San Jose City Council voted to accept a staff report that recommended replacing the wooden railroad trestle over the Los Gatos Creek with a new steel structure to serve as a pedestrian-bicycle bridge. On March 19, 2013, the City of San Jose held the first community meeting, gathering ideas from members of the public for the design of the Western Alignment of the Three Creeks Trail. The materials for that workshop, and the results can be found on the San Jose website; click here, and scroll down to “Workshop #1”. In January of 2013, the City of San Jose announced a series of three public community meetings to gather input, feedback, and ideas about the design and creation of the Three Creeks Trail: on March 19, May 29, and July 24, all from 6pm to 9 pm at the Willow Glen Community Center, 2175 Lincoln Avenue, San Jose 95125. On January 9, 2012, the City of San Jose announced the purchase of the western alignment of the Three Creeks Trail. On November 23, 2011, the City of San Jose announced the signing of a purchase agreement between the City and the UPRR, and the opening of escrow. On October 25, 2011, City Council adopted a new General Plan (“Envision 2040”) as well as a new Green Print. On September 27, 2011, the San Jose City Council voted to approve the purchase of this segment of the trail from the Union Pacific Railroad. During the course of the summer of 2011, the right-of-way of the western half of the alignment (from the Los Gatos Creek to Minnesota Avenue) was cleaned of the contaminants in the soil. Aerial Map (2.1MB PDF) of complete trail. East alignment (1.1MB PDF) from highway 87 east to Kelley Park. West alignment (1.2MB PDF) from Lonus near Lincoln to highway 87. 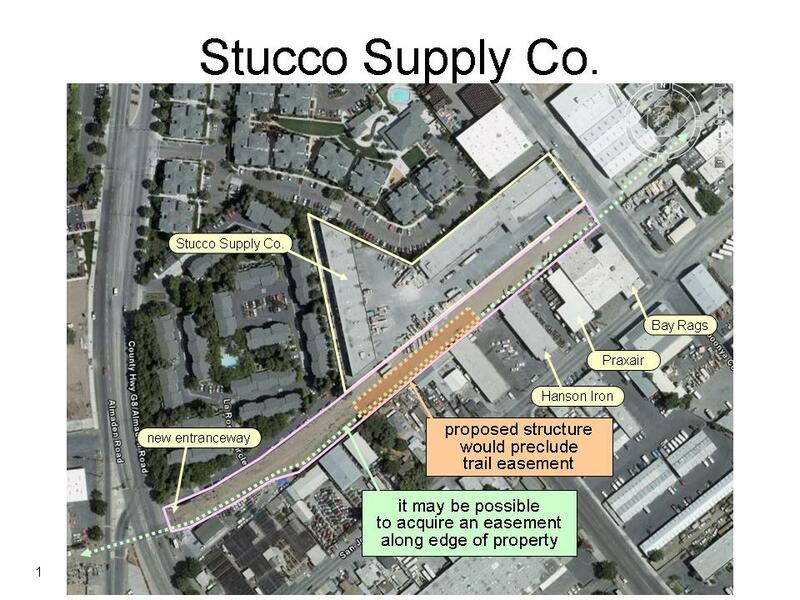 On Wednesday July 8th 2009, the San Jose Planning Department approved the erection of a canopy by Stucco Supply Company, which has purchased a portion of the former railway line. This will effectively block the trail right-of-way. An appeal was heard by the Planning Commission on Wednesday, August 26, 2009 at 6:30 p.m. in the City Council Chambers at San Jose City Hall. The appeal failed. Map of the Stucco Supply Co property and location of the canopy. Map of the entire Three-Creeks Trail showing how the loss of property will decrease connectivity to the region. A letter to the Director of the Planning Department of the City of San Jose explaining the problems with erecting a canopy (PDF 65kB) dated 6/20/2009. 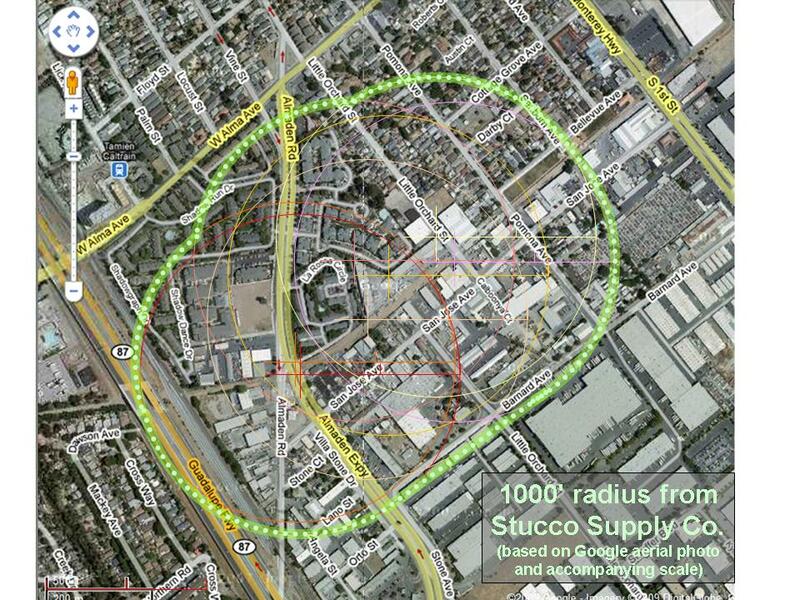 Map showing a 1000 foot radius from Stucco Supply Co. Residents within a 1000 foot radius from Stucco Supply Co can protest the canopy construction to the San Jose planning commission. Majority Report (1.9MB PDF) by the SJ Director of parks dated 11/13/2008, presenting the City of San Jose’s plan to create a trail of the West Alignment of the railroad tracks. Minority Report (0.5MB PDF) by Larry Ames dated 03/02/2009. A focus group organized by the City of San Jose concluded that the Eastern Alignment of the trail could be replaced by a bike lane on Alma. This white paper documents the challenges and benefits of developing the rail line as a trail. City of San Jose Site for Three Creaks Trail – This site focuses on the work that the city has done on the West Alignment. Article in the Willow Glen Resident (PDF 0.2MB) about Save Our Trails dated 3/13/2009 By Tiffany Carney. WGNA Support for the Three Creeks Trail dated 8/13/2007 by President of WGNA. San Jose Mercury News article about the Three Creeks Trail dated 11/16/2007. Willow Glen Resident article dated 10/26/2007 about the opening of a portion of the Guadalupe River Trail that goes under 280, also discusses the Three-Creeks Trail.